Statement by the Party of Labour of Austria (PdA), Vienna, 1 July 2018. From 1 July 2018 Austria will take its turn in the rotating Presidency of the Council of the European Union for six months. This applies in particular to the meetings of the General Affairs Council (the European and/or foreign ministers) and the meetings of the other specialist ministers of the EU member states, for which Gernot Blümel or his government colleagues responsible will act as hosts. Compared to the European Council (of Heads of State and Government) chaired by Donald Tusk, the European Commission (Jean-Claude Juncker) and the Council for Foreign Affairs (Federica Mogherini), the powers and opportunities of the six-monthly EU Council Presidency are limited. Some of the political content is now firmly prescribed (e.g. negotiations on Brexit, EU funding programmes and the multi-annual financial framework). The issues of refugees, asylum and migration are to a certain extent almost always on the EU agenda, which Sebastian Kurz’s ÖVP/FPÖ (Austrian People’s Party/Freedom Party) government will gladly accept. For Austria’s third EU Council Presidency after 1998 and 2006, the right-wing conservative government in Vienna has chosen the motto “A Europe that protects”. The geographical fact that the majority of Europe is outside the EU is a given. What Kurz, Strache, Kickl and the like mean by this slogan on the primary PR front, however, is clear: the EU’s external borders must be “protected” from refugees, but refugees fleeing war, terror, murder and persecution must not – a disgusting cynicism that is an expression of inhuman attitudes, but also political distraction. Because at the same time, at home the government is also proving what is not worth protecting, namely the interests and needs of working people and the socially weak, democratic standards, personal rights, civil rights and human rights. The open and direct attacks on the eight-hour day, on elements of workers’ self-government and trade union influence, on the already insufficient minimum level of insurance or on the independence of public service broadcasting speak for themselves. 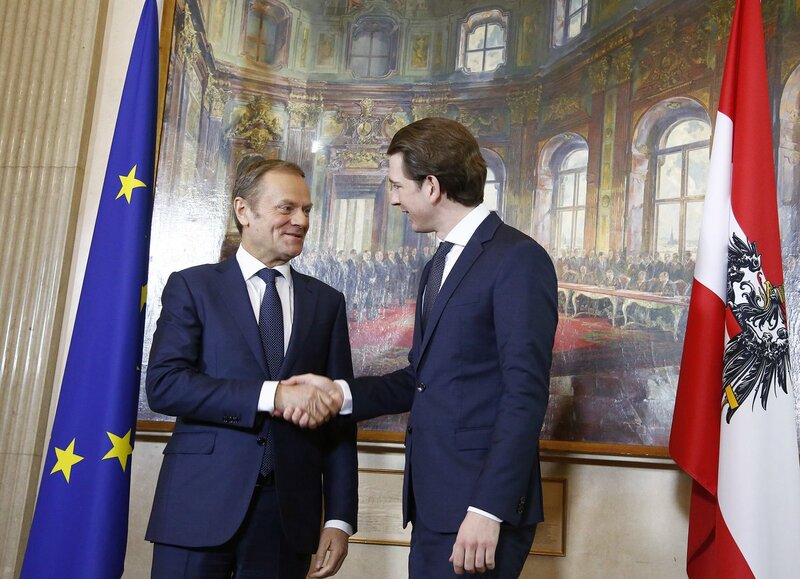 Even though the previous Social Democrat (SPÖ) led governments were in practice also system-compliant lackeys of capital, Kurz’s government now unashamedly represents the desired programme of the Federation of Austrian Industry, the banks and the agricultural groups with renewed intensity. For the working class this means intensified exploitation, for capital optimised profit maximisation. Since the government is aware of this line of confrontation, it plans to extend the powers, effectiveness and repressive powers of the police, intelligence services and the armed forces, all of which are in the hands of the extreme parliamentary right, supplemented by a corresponding orientation in the justice sector. When it comes to security, militarisation and arms build-up are ubiquitous. Austria’s participation in the new EU military structure PESCO, however, was decided together by the then SPÖ Chancellor Christian Kern and Foreign Minister Kurz – which is a clear statement that Austrian neutrality obviously appears to be nothing worth protecting, either for the ÖVP or for social democracy. On the international level too, in recent weeks the Kurz/Strache government has also positioned itself clearly: even if here too there have also been bilateral, i.e. transnationally effective social policy differences, the ÖVP/FPÖ coalition has consciously sided with the Visegrád states, thus with Viktor Orban and the Polish government. It is seeking an agreement with the xenophobic element of the new Italian government, a policy which also applies to Germany: Chancellor Kurz openly supports Interior Minister Horst Seehofer and the Bavarian CSU, while FPÖ representatives even appear at AfD events. The Austrian government has a somewhat more specific interest in the so-called Western Balkans: in a region in which not only Austrian monopoly capital, alongside the German and Italian, is setting the pace in an imperialist manner, but where the Austrian army is also stationed as a relevant part of the EU occupation army, and Montenegro, Albania, FYROM/North Macedonia, the pseudostate of Kosovo, partially Bosnia-Herzegovina and perhaps Serbia are to be more closely linked to the EU, i.e. made further dependent on it, without the need for early, full EU membership. With the help of the EU, Austria’s limited independent imperialism is seeking to bring its backyard under maximum control and to expand it. This is the somewhat more substantial core of the “Vienna-Berlin-Rome axis” propagated by Kurz with all its historical and neo-colonial implications. Regardless of the role and importance of the Austrian Council Presidency, the EU basically denotes the “Europe” of banks, corporations and the military. As an imperialist alliance, it stands for outward aggression and inward repression, for the pervasive rule of monopoly capital and the suppression of – even anticipated –emancipatory and potentially revolutionary forces of resistance. This essence of the EU makes it an illusion to aim to transform it into an instrument of social and democratic progress and peace. And in concrete terms it will not seriously serve as a counterpoint the social reactionary, anti-human policy of the Austrian government, because the EU and the Austrian government are largely compatible and by no means opposed. They complement one another. It would seem obvious – as in the past – to respond to important EU meetings of the Council Presidency with large rallies or other protest measures by the European Trade Union Confederation (ETUC). But the Social Democrat-dominated ETUC leadership in Brussels, like that of the Austrian Trade Union Confederation (ÖGB), apparently refuses to mobilise against the problem areas of austerity policy, budget cuts, privatisation, the EU posted workers’ directive or working-hours regulations in the international context. - resistance to military build-up, warmongering, EU and NATO intervention and occupation policies. Strengthened by the participation in the struggles of the working class and their education and organisation, the ultimate goal of the Party of Labour of Austria is not only to consign the current Austrian government and EU diktat to political history, but to overcome imperialism and capitalism together with all its political, economic and media instruments of rule, institutions and alliances. This will open the way to a future free of exploitation, oppression and war, the way to a Europe and a world of international friendship and solidarity, the revolutionary path to socialism and a classless society. Mit 1. Juli 2018 übernimmt Österreich turnusmäßig für sechs Monate den Vorsitz im Rat der Europäischen Union. Dies betrifft insbesondere die Tagungen des Rates für Allgemeine Angelegenheiten (der Europa- und/oder Außenminister) sowie die Treffen der sonstigen Fachminister der EU-Mitgliedstaaten, bei denen Gernot Blümel bzw. dessen ressortzuständige Regierungskollegen als Gastgeber fungieren werden. Gegenüber dem Europäischen Rat (der Staats- und Regierungschefs) unter Leitung Donald Tusks, der Europäischen Kommission (Jean-Claude Juncker) und dem Rat für Auswärtige Angelegenheiten (Federica Mogherini) sind die Kompetenzen und Möglichkeiten der halbjährlich wechselnden EU-Ratspräsidentschaft begrenzt. Einige der nun anstehenden politischen Inhalte sind fix vorgegeben (z.B. Verhandlungen über Brexit, EU-Förderprogramme und den mehrjährigen Finanzrahmen). Die Themen Flucht, Asyl und Migration setzen sich gewissermaßen von selbst fast permanent auf die EU-Agenda, was der ÖVP/FPÖ-Regierung von Sebastian Kurz aber ohnedies zu passe kommt. Für die dritte österreichische EU-Ratspräsidentschaft nach 1998 und 2006 hat die rechtskonservative Wiener Regierung das Motto „Ein Europa, das schützt“ gewählt. Die geografische Tatsache, dass der Großteil Europas außerhalb der EU liegt, sei geschenkt. Was Kurz, Strache, Kickl und Konsorten mit diesem Slogan jedoch an vorderster PR-Front meinen, ist klar: „Geschützt“ werden müssen die EU-Außengrenzen vor Flüchtenden, nicht aber etwa Flüchtende vor Krieg, Terror, Mord und Verfolgung – ein widerlicher Zynismus, der Ausdruck menschenfeindlicher Haltungen, aber auch politischer Ablenkungsmanöver ist. Denn gleichzeitig beweist die Regierung auch im Inland, was nicht schützenswert ist, nämlich die Interessen und Bedürfnisse der arbeitenden Menschen und der sozial Schwachen, demokratiepolitische Standards, Persönlichkeits-, Bürger- und Menschenrechte. Die offenen und direkten Angriffe auf den Achtstundentag, auf Elemente der ArbeitnehmerInnen-Selbstverwaltung und den gewerkschaftlichen Einfluss, auf die ohnedies zu geringe Mindestsicherung oder auch auf die Unabhängigkeit des öffentlich-rechtlichen Rundfunks sprechen eine deutliche Sprache. Wenngleich auch die vergangenen SPÖ-geführten Regierungen in der Praxis letztlich systemkonforme Lakaien des Kapitals waren, so vertritt die Regierung Kurz nun ganz ungeniert und mit neuer Intensität das Wunschprogramm der Industriellenvereinigung, der Banken und der Agrarkonzerne. Für die Arbeiterklasse bedeutet dies verschärfte Ausbeutungsbedingungen, für das Kapital optimierte Profitmaximierung. Da sich die Regierung dieser Konfrontationslinie bewusst ist, gehen mit ihr geplante Ausweitungen der Befugnisse, der Schlagkraft und der Repressionsmöglichkeiten im Bereich der Polizei, der Nachrichtendienste und des Bundesheeres einher, die sich allesamt in der Hand der extremen parlamentarischen Rechten befinden, ergänzt durch eine entsprechende Ausrichtung im Justizbereich. Militarisierung und Aufrüstung sind beim Thema „Sicherheit“ ohnedies allgegenwärtig. Die Teilnahme Österreichs an der neuen EU-Militärstruktur PESCO haben allerdings der damalige SPÖ-Bundeskanzler Christian Kern und Außenminister Kurz noch gemeinsam beschlossen – womit klar gesagt ist, dass die österreichische Neutralität offenbar ebenfalls nichts Schützenswertes darstellt, weder für die ÖVP noch für die Sozialdemokratie. Auch auf internationaler Ebene hat sich die Regierung Kurz/Strache in den letzten Wochen deutlich positioniert: Wenngleich es hier auch bilaterale, nämlich transnational wirksame sozialpolitische Differenzen gibt, so stellt sich die ÖVP/FPÖ-Koalition bewusst an die Seite der Visegrád-Staaten, damit an die Seite Viktor Orbans und der polnischen Regierung. Sie sucht die Übereinkunft mit dem fremdenfeindlichen Teil der neuen italienischen Regierung, was auch für Deutschland gelten dürfte: Bundeskanzler Kurz unterstützt offen Innenminister Horst Seehofer und die bayrische CSU, während FPÖ-Vertreter sogar bei AfD-Veranstaltungen auftreten. Ein etwas konkreteres Interesse verfolgt die österreichische Regierung am so genannten „Westbalkan“: In einer Region, in der nicht nur das österreichische Monopolkapital neben dem deutschen und italienischen auf imperialistische Weise tonangebend, sondern auch noch das österreichische Bundesheer als relevanter Teil der EU-Okkupationsarmee stationiert ist, sollen Montenegro, Albanien, EJRM/Nordmazedonien, der Pseudostaat Kosovo, partiell Bosnien-Herzegowina und vielleicht Serbien enger an die EU gebunden, d.h. von ihr weiter abhängig gemacht werden, ohne dass eine baldige EU-Vollmitgliedschaft zwingend folgen müsste. Mit Hilfe der EU will der eigenständig begrenzte österreichische Imperialismus hier seinen Hinterhof unter maximale Kontrolle bringen und ausweiten. Dies ist der etwas substantiellere Kern der von Kurz propagierten „Achse Wien-Berlin-Rom“ mit allen historischen und „neokolonialen“ Implikationen. Ungeachtet der Rolle und Bedeutung der österreichischen Ratspräsidentschaft, markiert die EU grundsätzlich das „Europa“ der Banken, Konzerne und Militärs. Als imperialistisches Bündnis steht sie für Aggression nach außen und Repression nach innen, für die durchdringende Herrschaft des Monopolkapitals und die – auch antizipierte – Niederhaltung emanzipatorischer und potentiell revolutionärer Kräfte des Widerstandes. Dieser Wesensinhalt der EU macht es zu einer Illusion, sie in ein Werkzeug des sozialen und demokratischen Fortschritts sowie des Friedens verwandeln zu wollen. Und im Konkreten wird sie keinen ernsthaften Kontrapunkt zur sozialreaktionären, menschenfeindlichen Politik der österreichischen Regierung setzen, denn die EU und die österreichische Regierung sind weitestgehend kompatibel und keinesfalls ein Gegensatzpaar. Sie ergänzen einander. Da erschiene es nahe liegend, wichtige EU-Treffen der Ratspräsidentschaft – wie in der Vergangenheit – durch große Kundgebungen oder sonstige Protestmaßnahmen des Europäischen Gewerkschaftsbundes (EGB) zu begleiten. Doch die sozialdemokratisch dominierte EGB-Führung in Brüssel wie jene des ÖGB verzichtet offenbar darauf, gegen die Problemfelder Austeritätspolitk, Sparzwang, Privatisierungsdiktat, EU-Entsenderichtline oder Arbeitszeitregelungen im internationalen Kontext zu mobilisieren. - den Widerstand gegen die militärische Aufrüstung, Kriegstreiberei, Interventions- und Okkupationspolitik der EU und der NATO. Gestärkt durch die Teilnahme an den Kämpfen der Arbeiterklasse und deren Aufklärung und Organisierung, ist es das schließliche Ziel der Partei der Arbeit Österreichs, nicht nur die gegenwärtige österreichische Regierung und das EU-Diktat ins politische Ausgedinge zu befördern, sondern den Imperialismus und Kapitalismus mitsamt all’ ihren politischen, wirtschaftlichen und medialen Herrschaftsinstrumenten, Institutionen und Bündnissen zu überwinden. Dies wird den Weg zu einer Zukunft ohne Ausbeutung, Unterdrückung und Krieg eröffnen, den Weg zu einem Europa und einer Welt der Völkerfreundschaft und der Solidarität, den revolutionären Weg zum Sozialismus und zur klassenlosen Gesellschaft.